GARLIC-ROASTED leg of lamb with anchovy and rosemary, and a bent suzette, a variation on the traditional crepes suzette, are just two of the offerings to be found in Outback Cooking (MUP, $34.95, in stores September 1), a cookbook aimed at those on the road. 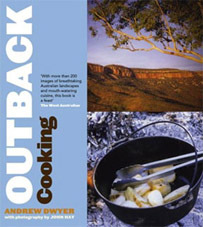 Author Andrew Dwyer, an experienced bushman and chef, begins his tome with handy tips on how to handle a camp oven, how to store and keep food fresh on the road and more. His recipes are interspersed with evocative outback photography by John Hay, who shot for Vogue Entertaining + Travel for 10 years. The glove-box sized book will make the perfect companion on that next trip. Who'd have thought one could whip up a Szechuan chicken on the fly?